Agastache foeniculum, Anise Hyssop. 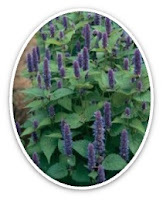 Anise hyssop is a perennial herb that is well known for its many useful herbal benefits, among that being its medical uses in the herbalist community. Used as an infusion in tea and cold remedies. ... A poultice of Agastache foeniculum is also useful in treating burns.